Quote: KITCHENER— The City of Kitchener and Waterloo Region are proposing giving up more than $10 million in taxes and fees over seven years to ease the way for the redevelopment of a vacant industrial site. NovaCore Communities Corporation, a Hamilton developer that specializes in rehabilitating old industrial sites, is proposing to build two apartment buildings, a retirement home as well as office and retail space on the 4.89-hectare (12-acre) site at 83 Elmsdale Dr., near Ottawa Street South and Strasburg Road. The site, which is owned by the city, was a Kitchener Utilities maintenance yard and has been vacant since 2011, when Kitchener consolidated its operations at a sprawling new facility on Goodrich Drive. A study commissioned by the developer estimates it will cost $10.4 million to clean up the site, which is contaminated with old landfill and construction waste such as bricks and rubber products, as well as zinc, mercury and dichlorobenzene, a group of chemicals that can harm the liver and kidneys. The environmental assessment also detected some groundwater contamination. Under the city and region's brownfield remediation programs, the developer would clean up and develop the site, and the city and region would absorb the $10.4 million cost of the cleanup through several years of foregone taxes. The city would waive $2.9 million in taxes; the region would waive $4.8 million in property taxes and $3.7 million in development charges. The municipal governments would grant annual rebates on property taxes, equal to the difference between the 2013 property taxes, and the property taxes that would apply to the redeveloped site. The rebate essentially allows the developer to pay property taxes for several years based on the old, pre-development assessed value. The annual tax rebates, which would last seven years, wouldn't begin until after the site is completely cleaned up and redeveloped, likely not before 2016. The city and region will be providing services, such as garbage collection, fire protection and so on, to the new development once it's done, but essentially not begin collecting taxes on those services for about seven years. Rob Morgan, who coordinates brownfield development for Kitchener, says the foregone taxes are a good investment. "We still get building permit fees, we still get development charges, in addition to the monies we will get from the sale of the land," he said. "We're getting future assessment, we're getting jobs, and a parcel of land that would likely be dormant for a considerable time is cleaned up and brought back to life," he said. The site now has an assessed value of $2.2 million, generating property taxes of just under $44,000 a year, split between the city and region. The plan to build 225 apartment units in two buildings of about seven to eight storeys, a 135-unit retirement home and 99,000 square feet of office and commercial space would represent a development assessed at $59.6 million, generating $1.2 million in annual property taxes under 2013 tax rates. "I think it's a very positive change from what is an unused industrial site," said city planner Katie Anderl. The proposed mixed development makes sense in that site, which is wedged between McLennan Park on the opposite side of Ottawa Street, and Elmsdale Park to the north. 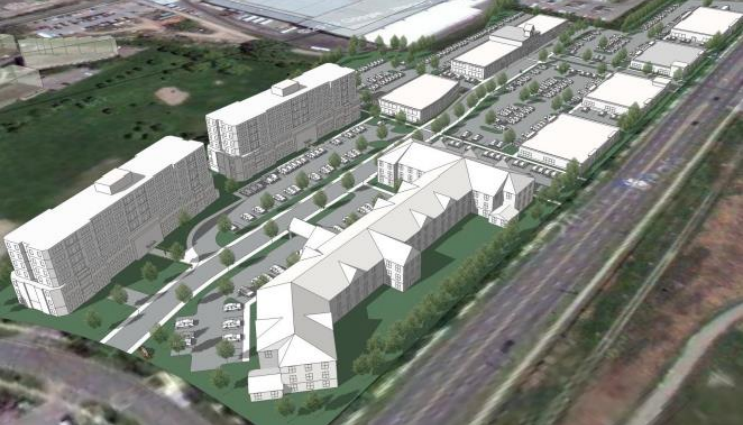 The apartments would be built closest to Elmsdale Park, with commercial and office looking onto Ottawa, and parking and access streets tucked in between the two. Most of the parking for the apartments and retirement home would be underground. The proposal also fits nicely with the city's planning goals of having residential areas within walking distance of offices and shops, and of having somewhat more intense development on transit corridors, Anderl said. The site is on the future Ottawa Street iXpress route, which connects to the light rail transit system. 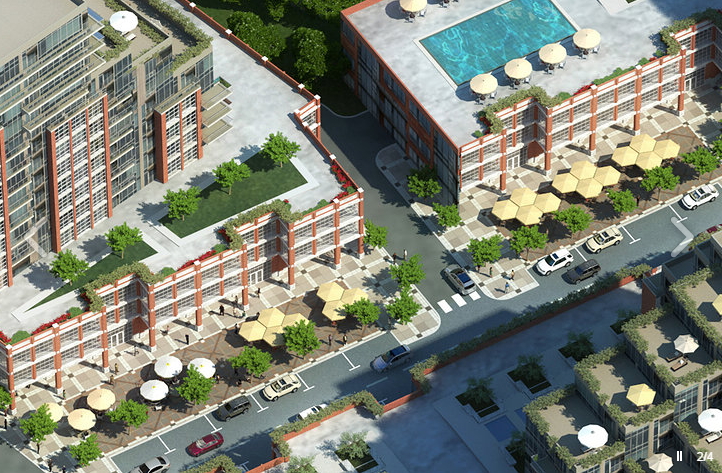 The region's planning committee approved the incentive grants on Tuesday. 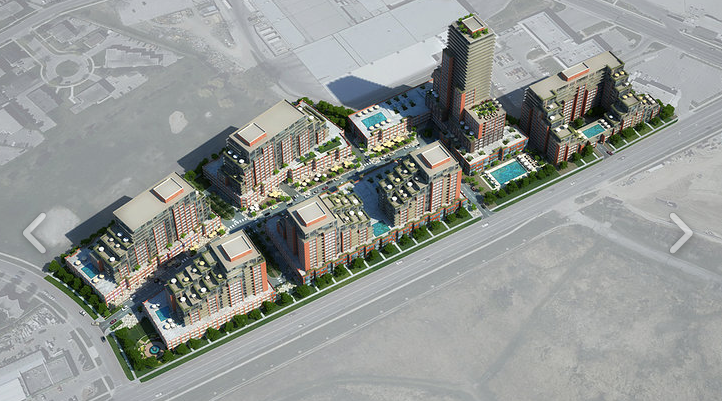 Kitchener's planning and finance committees consider the proposed development on June 23, which then goes to council on June 30. If approved, the sale is likely to close by August and remediation would start shortly thereafter. "My sense is the developer is keen to get going," Morgan said. Previous concept for 83 Elmsdale Dr details available here. It is amazing how much more creative and interesting this proposal was than the one that has been approved by the city. When I have more time I will likely add this to the lost opportunities thread. In so many ways as a region we have seen huge steps taken forward in terms of planning and creative design and than at other times we accept mediocre projects. Quote: I have been following the redevelopment of 83 Elmsdale Dr in Kitchener ever since the consolidated public site works project began. Unfortunately I will be unable to attend the public meeting for this project. The City of Kitchener and the Region of Waterloo have created innovative policies over the past decade to foster new developments in established areas and protect green space from being consumed. These policies are working to create a healthier and exciting community. 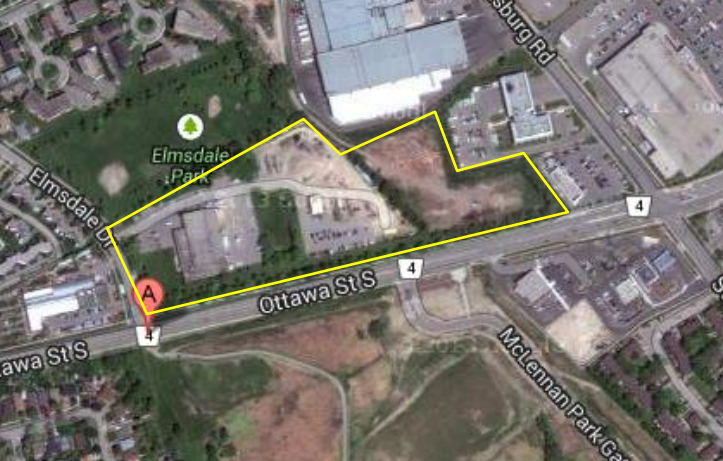 The potential of the site at 83 Elmsdale dr is huge and could redefine it's surrounding neighbourhoods. There needs to be an emphasis on strong street interaction, architecture, high density, mixed use, transit and sustainability. An earlier proposal for this property by Audax Architecture was exactly the kind of project that would transform this land into something that could be a regional focal point for unique and exciting communities. The current sample proposals put forth in the documentation (http://www.kitchener.ca/en/Calendar/Coun...25489708f4) are much more of the same big box, car oriented, bland projects that the Region and City are trying to move away from in order to inspire a creative and competitive city. I would really hope council holds Novacore Communities Corporation to higher standard than the sample proposals put forth. My wife and I love living in Kitchener, in part due to the innovative policies that are re-shaping the region. Access to public transit and pedestrian infrastructure are the some of the big reasons that we have decided to settle here and start our family. This is the response I received from the city planning department in regards to my email comparing this previous concept to the new approved concept in June. Quote: Thank you for your comments. As articulated in the report, staff are supportive of the proposed medium density development that is being contemplated for 83 Elmsdale. I acknowledge that the first proposal that you have referenced is much denser and more intensive than the proposal which is currently being considered. Staff are of the opinion that the current proposal includes an appropriate mix of residential and commercial uses, at a height and density that is compatible within the context of the surrounding community, while also helping to increase density to help to support transit. A special focus has been placed on achieving a high quality development on these lands. 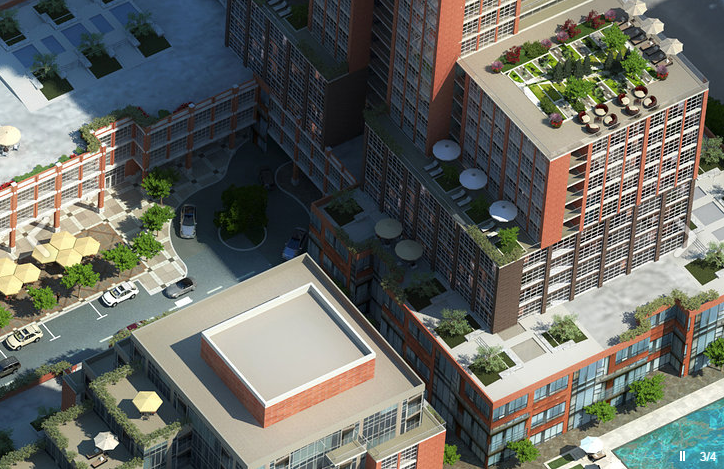 The Urban Design Guidelines will help to shape the future development so that a strong emphasis is placed on developing a pedestrian friendly, attractive streetscape, and designing buildings which both address the street and which allow for an appropriate transition from the lower density development surrounding the site. Thanks for your comments (and for the positive feedback on the city’s redevelopment policies and growth direction). The old concept was fabulous. The current concept is ..... not fabulous. You can certainly say that again. This to me looks like the same old generic big box retail with an ordinary apartment complex. Would it really be that great an idea to create downtown-scale density far away from the downtown and the LRT? I mean, the concept does look much better, but I think the point is reasonable that the context of the surrounding area is relevant. (10-09-2014, 04:56 PM)panamaniac Wrote: The old concept was fabulous. The current concept is ..... not fabulous. The current concept is certainly not fabulous. The old concept was good, but I don't know about fabulous. I loved the buildings and the massing, but I didn't like how it turned it's back on Ottawa street to create a new main street. Why not front Ottawa? (10-09-2014, 10:44 PM)mpd618 Wrote: Would it really be that great an idea to create downtown-scale density far away from the downtown and the LRT? I mean, the concept does look much better, but I think the point is reasonable that the context of the surrounding area is relevant. I'm leaning this way on this project. I feel like if we're going to build this dense, if it's not downtown, it should at the very least be at a transit station. This density for this location would be perfect in maybe 30 years. There's other more important spots that need to be addressed. It's only 2km down Ottawa St. to get to the LRT station. If Ottawa st. were to have an express bus passing by all the time it really wouldn't be an onerous journey to get anywhere by transit. Ottawa St. toward downtown from this point has a lot of potential; there's the Ford dealership that could take a hike, the huge lawn that the Board of Education maintains for no real reason, the Concordia Club's huge property also has a lot of potential for something greater. I think it's really short-sighted for the city to allow such car-centric development is an area that is already pretty congested. I'd rather see the first proposal tweaked so it faced out to Ottawa street. Something like the first proposal would be awesome at the block across from Cameron Heights or even on some of the old Schneiders land. (10-10-2014, 09:07 AM)clasher Wrote: It's only 2km down Ottawa St. to get to the LRT station. If Ottawa st. were to have an express bus passing by all the time it really wouldn't be an onerous journey to get anywhere by transit. We're probably at least a decade away from having buses on Ottawa Street any more frequent than every 15 minutes. Given the amount of developable land within walking distance of the LRT line, 2km down a cross corridor route is pretty far away. I think there would be a better case for density at an intersection of two iXpress routes, e.g. at Fischer-Hallman and Ottawa. I thought the Ottawa St cross-town route was slated for 2017. Won't that be a frequent service? This reminds me. The Elmsdale project has been delayed by the Ministry of Environment rejecting NovaCore's site remediation plan. This came up in council Planning and Works when a rep asked to defer the issue of whether there should be a signalized intersection or crossing across from the site to McLennan Park. They expected to have site remediation underway Aug/Sept of this year but it has been pushed to 2015. 2017 shows Ottawa Express and that seems like a lot of hours compared to the rest of the projects listed on that page so hopefully it's 15 minutes or better frequency. (10-10-2014, 01:39 PM)panamaniac Wrote: I thought the Ottawa St cross-town route was slated for 2017. Won't that be a frequent service? If we're lucky, it will start at a frequency of every 15 minutes. I don't think there is a plausible scenario in which it would be more frequent than that in the foreseeable future. Has there been any movement on this project. My thoughts, rant over for now!